Check back! We will add new events throughout the season. In addition to events there are 17 parks, 6 major trails, 5 historic and preserve sites, 2, dog parks, 4 lakes, 17 miles of river, and 3+ months of summer to experience the river in your own way. Explore and make it your own! On April 25th we welcomed the goats back to Saint Paul. The herd from Goat Dispatch started their work munching invasive plants at Crosby Park. They will split their time between Crosby and Indian Mounds Park throughout the 2018 Season. Track their whereabouts. Paddle Share Season Begins May 26th. 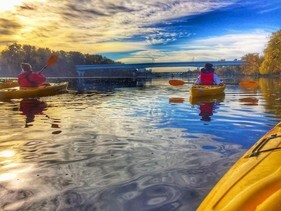 Mississippi River Paddle Share is a self-service kayak rental program ideal for people with some kayaking experience looking to enjoy the river. This is a one of a kind partnership between National Park Service and metro area cities. Come out and experience your National Park! Saint Paul offers a 6.3 mile paddle from Hidden Falls to Harriet Island Regional Park. New in 2018 we will host Paddle Share at Pickerel Lake in Lilydale Regional Park for those who are looking for a riverside lake experience. The Pickerel Lake Station will also feature adaptive kayaks and gear by Creating Ability. The Pickerel station will launch mid-summer. Check back for updates. Great River Passage, Saint Paul Parks and Recreation in partnership with Wilderness Inquiry offer camping at the river each month. Saint Paul families new to camping are invited to register for this free event. 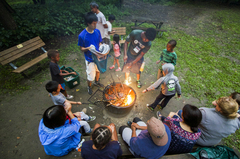 You will learn to set up a tent and cook over an open fire; participate in river related activities, hikes, art making, socializing and S'mores around the campfire. All camping gear and food is included for this free event! A few spaces are still available or sign up for the waitlist. We will accommodate as many families as we can. Register here by searching “family camping” and selecting your preferred dates.